1. 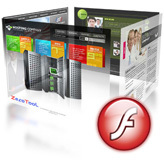 Open your .FLA file from ‘sources/flash’ folder in Adobe Flash program. 3. Change the symbol type to ‘Movie Clip’ and give it a name. 4. Import your .FLV file to the library (File -> Import to library). 1. Open the ‘site_flash’ folder and locate ‘tfile_main.xml’ file. 2. Open the ‘tfile_main.xml’ file in Adobe Dreamweaver. 3. Locate the ‘read more’ text and copy it. 1. We will need 3 pictures with dimensions 180×180 pixels and 3 thumbnails for those pictures with dimensions 60×60 pixels. Give them names as image-1.jpg, image-2.jpg, image-3.jpg and thumb-1.jpg, thumb-2.jpg, thumb-3.jpg.